Virtual Office Miami Brickell Avenue is our most exclusive location in Miami. 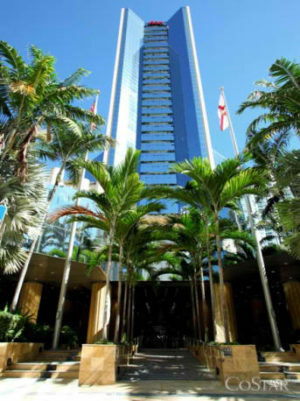 The A-Class building is located at Brickell Bay Drive one block off Brickell Avenue, famous Miami financial district. The prestigious modern built-out and views over the bay make this location the prime choice for the most demanding customer. Your clients will love the appearance and professionalism the facility is giving just at the first glance already. With a whole floor of executive office suites and trained staff on side to attend to your every office need, you can start your Virtual Office Miami Brickell Avenue corporate presence for a very marginal price compared to traditional office space. Whether you just want to start with a virtual office presence or choose one of our Miami Executive Office Suites for a permanent solution, you will be delighted with the services. Simply choose your location and add live phone answering services as well as virtual assistant services as you need it. You will always only pay for the exact time you used the services. For a tour of the location, do not hesitate to contact us, we will be happy to schedule a meeting with one of our managers on side. This virtual office location in Birmingham Alabama is easy to access and has ample parking around the building. Technically setup to fulfill the demands of the demanding business person, with professional staff on side to assist you. This is one out of four locations in Atlanta, Georgia. Two full floors of executive office suites and virtual office services at the popular Buckhead area, just north of midtown Atlanta.